Established cancer cell lines and xenografts have been the mainstay of cancer research for the past several decades. However, recent evidence suggests that therapeutic response is greatly influenced by the tumor cell microenvironment. Therefore, we have developed an ex vivo analysis of primary tumor specimens for drug development purposes. Corben, A. D., Uddin, M. M., Crawford, B., Farooq, M., Modi, S., Gerecitano, J., Chiosis, G., Alpaugh, M. L. Ex Vivo Treatment Response of Primary Tumors and/or Associated Metastases for Preclinical and Clinical Development of Therapeutics. J. Vis. Exp. (92), e52157, doi:10.3791/52157 (2014). The molecular analysis of established cancer cell lines has been the mainstay of cancer research for the past several decades. Cell culture provides both direct and rapid analysis of therapeutic sensitivity and resistance. However, recent evidence suggests that therapeutic response is not exclusive to the inherent molecular composition of cancer cells but rather is greatly influenced by the tumor cell microenvironment, a feature that cannot be recapitulated by traditional culturing methods. Even implementation of tumor xenografts, though providing a wealth of information on drug delivery/efficacy, cannot capture the tumor cell/microenvironment crosstalk (i.e., soluble factors) that occurs within human tumors and greatly impacts tumor response. To this extent, we have developed an ex vivo (fresh tissue sectioning) technique which allows for the direct assessment of treatment response for preclinical and clinical therapeutics development. This technique maintains tissue integrity and cellular architecture within the tumor cell/microenvironment context throughout treatment response providing a more precise means to assess drug efficacy. Developing efficacious cancer therapeutics has proven to be extremely challenging. Cancer cell lines and tumor explants - as well as xenografts have been used in cancer research for over half a century1,2,3. To date, the molecular analysis of drug sensitivity and resistance in both established cancer cell lines and patient-derived xenografts (PDX) is indispensable. However, testing of compounds in established cancer cell lines is not often predictive of in vivo efficacy, and corresponding in vivo studies in animals, especially in PDX models, is very expensive and time consuming. The limitations of these model systems, namely the inability to inform on the influence of the native microenvironment in tumor progression and response to therapeutic strategies, has led the research field to develop additional methods to compliment these analyses. Of recent, heightened attention is being paid towards ex vivo analysis of patient tumor explants 4, 5 due to the greater understanding that cancer therapeutic response is not exclusive to the inherent molecular composition of cancer cells but rather is greatly influenced by the tumor cell microenvironment 6, 7 a feature that cannot be recapitulated by traditional culturing methods and/or PDX. Ex vivo analysis in the above context (i.e., influence of adjacent surrounding tumor cell microenvironment) implies assessment of viable primary tumor/metastasis sections, rather than ex vivo analysis of cellular isolates 8, 9. We report here on an ex vivo technique (i.e., precision-sliced fresh tissue sections) of both patient primary tumors and associated metastases (i.e., lymph nodes) that faithfully informs on response (IC50), off-target effects and allows for molecular analysis of resistance and feedback mechanisms. Additionally, a correlative analysis of therapeutic sensitivity/resistance versus biomarker and gene expression profile can be performed in an effort to identify patients more likely to respond to the experimental drug of interest (i.e., high drug response matches patient with particular biological profile). Application of the ex vivo technique and assessment in a multi-parameter fashion is movement towards patient selection and overall improvement of clinical outcomes. Ex vivo treatment response analysis could become a standard tool in the preclinical and clinical development of cancer therapeutics and is envisioned as a step towards a personalized medicine approach in therapeutic development strategies. NOTE: Patient tissue procurement was authorized through institutionally review board (IRB)-approved Biospecimen and Clinical Protocols (Protocol numbers 09-121 and 11-041, respectively) at Memorial Sloan Kettering Cancer Center. NOTE: To date, this protocol has been performed on surgically removed pancreatic, gastric and breast tumor types, as well as, lymphoma metastases. Direct the Surgical team to deliver the specimen by courier or pneumatic tube system to the Pathology department in tightly sealed and sterile leak-proof plastic specimen bag within sterile spill-proof container. Direct the Surgical team to transport the specimen in the fresh state with no formalin or fixative. Direct the pathologist or pathologist assistant to harvest the fresh specimen using sterile technique, which includes use of sterile gloves and instruments under a laminar flow hood. Record the harvesting time of the procured specimen, which is kept rigorously under 30 min from the completion of the surgical procedure. Taking into consideration effects of cold ischemia, do not take samples from resected specimens with a cold ischemic time of > 30 min18. Direct the Pathology Department personnel to remove a primary tumor specimen of approximately 0.5 cm3 to 1.0 cm3 in a laminar flow hood to maintain a sterile environment. When possible, choose tumor tissue from the periphery of the index lesion to avoid potential frank central necrosis (cell death). NOTE: The necrotic tissue may be grossly recognizable by any of the following criteria: loss of color or paleness of the tissue; loss of strength in which necrotic tissue is soft and friable; a distinct demarcation between the necrotic and viable tissue. Direct the pathologist or pathologist assistant to provide peripheral tissue that is in excess (surgical discard) after immediate sampling of the tumor for diagnostic evaluation. Place the specimen in a 15 ml sterile conical centrifuge tube containing approximately 5 ml of minimum essential media (MEM) containing 1% antibiotics (penicillin and streptomycin). If available (e.g., lymph node of axillary tail of mastectomy specimen), procure a grossly positive associated lymph node specimen of the same size (0.5 cm3 to 1.0 cm3) and compare to drug response of primary tumor. Like the primary tumor specimen, place the associated lymph node specimen in a 15 ml sterile conical centrifuge tube containing approximately 5 ml of minimum essential media (MEM) containing 1% antibiotics (penicillin and streptomycin). If size of surgical specimen permits (e.g., mastectomy specimen), remove (distant from primary tumor) a sample of normal tissue (i.e., normal dense/fibrous breast parenchyma) and place in a 15 ml sterile conical centrifuge tube containing approximately 5 ml of minimum essential media (MEM) containing 1% antibiotics for transfer purposes only. Following transfer to the laboratory facilities, transfer the ‘normal’ specimen to a cryovial, ‘snap’ freeze and store in a -80 °C freezer for future molecular analyses. Place all specimens on wet ice and immediately transport to the laboratory space for ex vivo fresh tissue sectioning. Do not section the normal specimen but rather store in a -80 °C freezer for future molecular analyses. Transfer a portion of the primary tumor and associated metastasis to a cryovial, ‘snap’ freeze and store in a -80 °C freezer for future molecular analyses. NOTE: We obtain tumor tissues from patients enrolled on clinical protocols who give their consent to undergo a CNB of an accessible tumor metastasis prior to the start of therapy. CNBs, to date, have been performed on patients with breast, marginal zone lymphoma, mantle cell lymphoma, metastatic paraganglioma, cervix (squamous cell) and ovarian cancers. Have clinical personnel from Interventional Radiology or relevant department perform a pre-treatment core needle biopsy and place the specimen in a 15 ml sterile conical centrifuge tube containing approximately 5 ml of minimum essential media (MEM) containing 1% antibiotics (penicillin and streptomycin). Place the biopsy specimen on wet ice and immediately transport to the laboratory space for ex vivo fresh tissue sectioning. Make a 4% agarose solution by adding 4 g of agarose to 100 ml of PBS. Autoclave (cycle settings: liquid, 121 °C, 30 min, 15 pounds per square inch) the solution before first use. For subsequent uses, place the 4% agarose in a microwave to liquefy (High heat for 30 sec intervals) prior to each use and cool appropriately to ~ 25 °C (i.e., warm to touch) mindful that agarose solidifies at RT. Use the 4% agarose as a non-permanent tissue embedding media. When the 4% agarose has cooled sufficiently and is still in a liquid state, with sterile forceps place the tissue specimen in an embedding mold and pour in the 4% agarose. Position the tissue specimen close (~ 2 mm distance) but not directly on the cutting surface wall of the embedding mold. The 4% agarose will begin to solidify quickly, therefore appropriately position the tissue specimen quickly. During sectioning, keep the 4% agarose in a 55 °C water bath to keep in solution. To a 24-well plate for section analysis, add 1 ml of complete media (i.e., MEM + 10% fetal bovine serum + 1% antibiotics) to each well. Keep the 24-well plate at RT (~25 °C) throughout the duration of sectioning. Using the vibrating microtome, set the speed at which the blade approaches the specimen [0 (0.00 mm/sec) to 10 (2.5 mm/sec)] and the frequency of the blade [0 (0 Hz) to 10 (100 Hz)]. Adjust the settings according to the texture of the tissue (i.e., density/firmness). For a primary breast tumor of invasive ductal carcinoma, adjust settings to 6 and 3, speed and frequency respectively. For less dense/firm tumor tissue, decrease speed and increase frequency accordingly. Set the section thickness within the instrument limits (1 – 999 µm). For these analyses, set the section thickness at 200 µm. Mount the agarose-embedded specimen using a thin layer of liquid adhesive on the specimen disc that is submersed in a reservoir of media that is encased in wet ice. Remove the precision-sliced sections immediately upon sectioning using sterile forceps and place in a multi-well plate with 1 ml of complete media. When sufficient sections are acquired for response and correlative analyses, place the multi-well plate for treatment response in a tissue culture incubator set at standard tissue culturing conditions. Take multiple control sections that bookend the treated sections in an effort to confirm dose-dependent response as opposed to cultured artifacts. Perform tissue sectioning rapidly (~30 – 40 min), well within any detrimental effects of cold ischemic time (~2 – 4 hr)18. Perform treatment of sections only following a 1 hr acclimation period. Following the 1 hr acclimation period, add increasing doses (therapeutically relevant; e.g., 0 – 10 μM concentrations) of drug to the sections and house under standard tissue culture conditions for the treatment period. For this study, use 24 and/or 48 hr assessment periods. However, control (vehicle only) tissue sections will remain viable, as tested in this study, for periods up to and including 96 hr assessment periods. Following treatment, remove all sections under sterile conditions and formalin-fix by placing the tissue section in a tube containing either 10% buffered formalin and place at RT O/N or in a tube containing 4% paraformaldehyde (dilute 16% paraformaldehyde from a vial with PBS for a final concentration of 4%) and place at RT for 2 hr. Fix larger tissue sections (e.g., ~6 mm x 4 mm) 200 μm thick in 10% buffered formalin O/N at RT. Fix smaller sections (e.g., 1 mm x 1 mm) 200 μm thick in 4% paraformaldehyde for 2 hr at RT. NOTE: For efficient penetration of fixative the volume of fixative should be 20x the volume of tissue. Given that this protocol results in extremely small tissue sizes (e.g., 6 mm3 tissue = 6 μl volume), for assurance of proper fixation use 1 ml of fixative for all tissue sizes. Following fixation have the tissue specimens paraffin embedded by the Pathology Department personnel. Section specimen paraffin blocks onto charged slides to be hematoxylin and eosin stained and assessed immunohistochemically (e.g., apoptosis). For this study, the ex vivo technique was used in a correlative analysis of therapeutic sensitivity/resistance of a heat shock protein 90 inhibitor (Hsp90i). In a preclinical assessment of this Hsp90i, the breast cancer primary tumor, an ER+ invasive ductal carcinoma (IDC), and associated lymph node metastasis were analyzed ex vivo for treatment response (Figure 1). Multiple 200 μm serial sections were treated with vehicle only and increasing doses (0.25, 0.50, 1.0 and 2.5 μM) of the Hsp90i. The data in Figure 1 represents formalin-fixed, paraffin-embedded (FFPE) and hematoxylin & eosin (H&E) stained sections following a 48 hr treatment period. 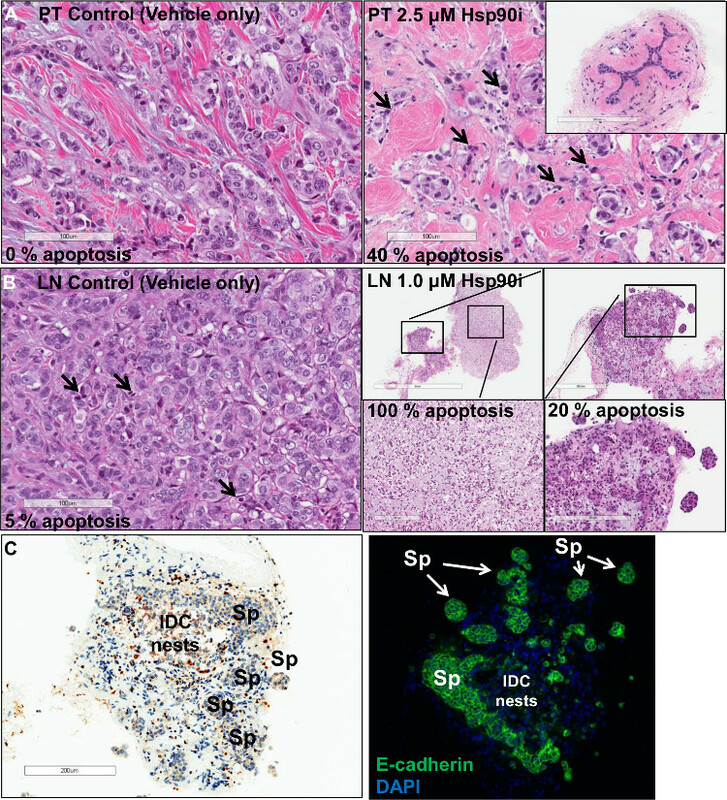 The control (vehicle only) treated section shows viable IDC nests whereas the 2.5 μM treated tissue section resulted in a 40% induction of apoptosis as seen by nuclear morphological changes (i.e., pyknotic nuclei/apoptotic debris) (Figure 1A). Apoptosis was further confirmed in the primary tumor by terminal deoxynucleotidyl transferase dUTP nick end labeling (TUNEL) analysis (data not shown). IC50 is calculated from response data by graphing percent apoptosis versus concentration of the drug. Significantly, the chaperone, Hsp90 plays a key role in protein stabilization and homeostasis of critical signaling pathways of both normal and cancer cells 10. The ability to target Hsp90 in cancer relies on the finding that malignant cells heavily depend on the chaperoning function of Hsp90, especially in an effort to overcome stressed states of inhospitable environments encountered during metastatic progression. In essence, cancer cells become highly dependent on Hsp90 function resulting in a targetable selective pool of ‘oncogenic’ Hsp90 11. In the insert, Figure 1A, adjacent benign lobule with associated acini and duct remains unaltered in the same 2.5 μM Hsp90i-treated section. To our knowledge, this is the first time this Hsp90 cancer-specificity is visually captured in Hsp90i response-assessment of primary tumors and associated metastases. This finding of unaltered benign/normal cells as seen in adjacent benign lobules of IDC (Figure 1A) as well as vessels within the surrounding benign breast parenchyma of the primary tumor and associated lymph node metastases (data not shown) has been recapitulated in several different tumor types (e.g., breast, gastric and lymphoma metastases). An accompanying lymph node metastasis of this primary tumor showed a complete response only in the IDC nests that were loosely associated (Figure 1B). IDC nests that formed tight spheroids, however, remained viable as confirmed by TUNEL (Figure 1C). Additional analysis of the viable IDC spheroids by immunofluorescence revealed a persistent or re-expression of the cell-cell adhesion molecule, E-cadherin (Figure 1C). This finding is consistent with persistent, over-expression of E-cadherin adding to the metastatic potential or metastatic efficiency as reflected in the highly malignant, lethal inflammatory breast cancer 12, 13. Although interesting, this finding is beyond the scope of this paper. However, it is significant to note that these lymph node (LN) IDC spheroids were maintained in culture for a period of 2 weeks and thus lends credence to the strength of using the ex vivo technique to study both sensitivity/resistance in preclinical drug development. The ex vivo technique has also been employed in a clinical study on core needle biopsies (CNBs) for evidence of target inhibition in tumors16,17. Patients who consent, have a pre-treatment core needle biopsy (CNB) procedure performed (Figure 2). Comparable to the preclinical assessment of primary tumors, the ex vivo technique is used to determine sensitivity or response in the CNB of accessible metastases. Multiple 200 μm serial sections of the CNB were treated with vehicle only and increasing doses (0.25, 0.50, 1.0 and 2.5 μM) of the Hsp90i. The number of Hsp90i doses used in ex vivo assessment is dictated by the size of CNB. However, every effort is made to use the spectrum of doses suggested above. 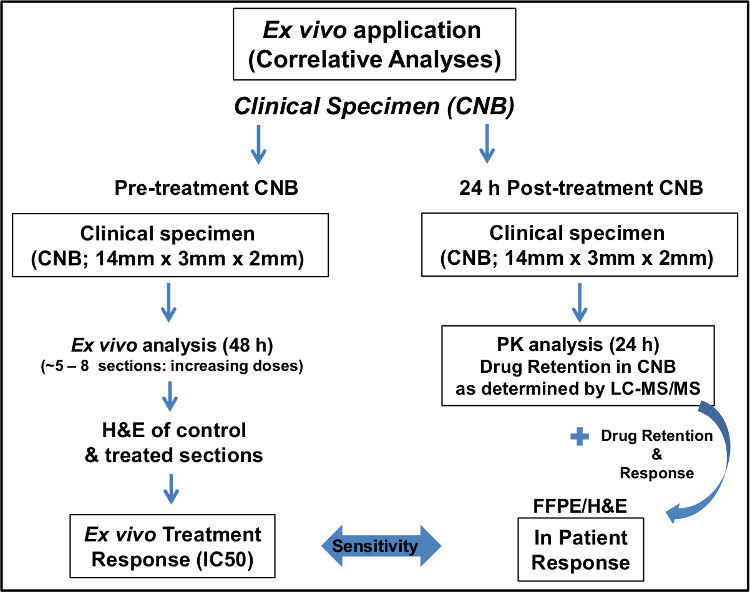 Like the preclinical ex vivo assessment, response can be evaluated and later compared to the actual in patient response (i.e., correlative analyses; Figure 2) as determined by post-treatment CNB pharmacokinetic (PK), i.e., drug retention as measured via liquid chromatography tandem mass spectrometry (LC-MS/MS) analyses as well as in patient PET imaging (Figure 2)16,17. To date, analyses using the ex vivo technique in this clinical study has been performed on multiple tumor types (e.g., breast, marginal zone lymphoma, mantle cell lymphoma, metastatic paraganglioma, cervix and ovarian cancers)16, 17. Full correlative analysis implementing the ex vivo technique further exemplifies the utility of this technique in clinical drug development. Figure 1. Ex vivo response analysis of an ER+ breast cancer. (A, Left panel) displays viable nests of invasive ductal carcinoma (IDC) (Hematoxylin and eosin stained; scale bar 100 μm). Upon treatment (A, right panel) with 2.5 μM of Hsp90i there is an induction of ~40% apoptotic response (pyknotic nuclei/apoptotic debris; arrows) (Hematoxylin and eosin stained; scale bar 100 μm). Benign lobules (A, insert) remain unaltered following treatment (Hematoxylin and eosin stained; scale bar 200 μm). The control of an associated lymph node (LN) (B, left panel) displays a small level of apoptosis (Hematoxylin and eosin stained; scale bar 100 μm), whereas the treated section (B, right panels) show an area of metastatic IDC nests with complete response (Hematoxylin and eosin stained; scale bar, clockwise 2 mm, 300 μm, 200 μm and 200 μm). However, tight IDC spheroids (Spheroids; Sp) from the same section (C, left panel) show little, if any, apoptosis as shown by TUNEL analysis remaining viable with a concomitant (scale bar 200 μm) (C, right panel) over-expression of E-cadherin (magnification 100X). Please click here to view a larger version of this figure. Figure 2. Schematic of implementation of ex vivo technique in a clinical study. Please click here to view a larger version of this figure. Cancer biologists face significant challenges when attempting to develop efficacious therapeutic strategies. Testing drugs in development on established cancer cell lines cannot accurately reflect in vivo response and in vivo experiments on PDX models are labor intensive and very expensive. Given the above, the application of ex vivo techniques of primary patient tumors14, 15 is now positioned beside the molecular analysis of established cancer cell lines and patient-derived xenografts (PDX). This paper takes the application of the ex vivo technique to a new height in that the technique faithfully informs on response (IC50), off-target effects and allows for molecular analysis of resistance and feedback mechanisms. When response data is correlated to the tumor molecular profile (i.e., protein expression of tumor biomarkers, mutations) the correlative study (response vs. tumor molecular profile) can be used to select patients more likely to respond to a particular drug, in an effort to improve patient outcomes. Most significantly, in clinical drug development (i.e., optional biopsies), ex vivo response of pretreatment CNB can be correlated to (and validated) in patient response (i.e., post-treatment CNB) and drug retention (pharmacokinetic (PK) evaluation)16,17. The use of the ex vivo technique in this clinical study was able to determine tumor response as well as confirm target specificity (i.e., PD; Hsp70 induction) and inform on dosage and scheduling16,17. The ex vivo technique is amenable to most solid tumor types as well as blood-borne cancer metastases (e.g., lymph node metastases of lymphoma) with slight adjustments in the protocol for certain tumor types that present minor challenges. For instance, tumors of the pancreas tend to have a high stroma to tumor cell ratio, which can result in sections that have poor cancer cell representation. Procurement of cancer cell rich areas of the tumor cannot be made upon gross analysis. Therefore to overcome this potential shortcoming multiple smaller cubic areas from the tumor specimen can be embedded (4/agarose-embedding mold) and sectioned simultaneously increasing the probability of a tumor cell-rich ex vivo section. Our data strongly support the use of the ex vivo technique in preclinical drug development (Figure 1). Along with response (IC50), replicate sections can be analyzed for alternate viability assays, metabolomics, combinatorial therapeutic strategies, effect drug exposure has on secreted factors (e.g., cytokines, exosomes), resistance and feedback mechanisms and importantly, inform on off-target effects (i.e., normal and benign cells). In this particular study that used an Hsp90i, target specificity and identification of ‘off-target effects’ is key based on the premise that there is a distinctive pool of ‘oncogenic Hsp90’ only found in cancer cells upon malignant transformation10. This is presented in the results section (insert, Figure 1A) where benign lobules of an ex vivo Hsp90i-treated section remained unaltered. Of equal significance, found in another section of the same primary tumor reflected in Figure 1, a 10 μM (therapeutically irrelevant dose) treated section showed complete response of IDC nests whereas associated ductal carcinoma in situ (DCIS) remained unaltered (data not shown). Future investigations in this line of research are beyond the scope of this paper. However, this particular finding informs on the state of ‘malignant transformation’ or disease progression of associated DCIS in IDC specimens, with respect to the oncogenic Hsp90 chaperoning functioning and supports the utility of using the ex vivo technique in drug development. An additional application of the ex vivo technique is use in pre-efficacy analysis in tumor xenograft models (i.e., ex vivo sectioning of PDX) in drug development to determine the pharmacokinetic/pharmacodynamic (PK/PD) data prior to performing involved, costly in vivo studies – allowing for a more informed, cost-effective in vivo drug efficacy study. The key steps and potential limiting factors of the ex vivo technique are procurement and sectioning. Procurement of the tumor specimen (i.e., primary tumor/metastasis) must be performed expeditiously with close attention to identifying an area of the tumor with the highest degree of viability. Large tumors tend to have necrotic central areas that are not grossly visible. Therefore, procuring tissue from the outer-most rim increases probability of obtaining a viable specimen. With respect to sectioning, collecting precision slices at the desired thickness (e.g., 200 μm) is greatly influenced by tumor density/firmness (excluding CNBs due to the extremely small size). For instance, invasive ductal carcinoma is typically much denser in contrast to invasive lobular carcinoma. Dense tumor tissue provides appropriate resistance — in absence of permanent embedding media — to the blade, whereas less dense tumor tissue does not. Examples of less dense tumor tissue types include but are not limited to invasive lobular carcinoma, mucinous carcinomas and gastric tumor types. To overcome this potential limitation, trouble-shooting with appropriate blade speed and frequency is required. Consistent precision-sliced section thickness, throughout the sectioning process, is critical for accurate assessment of drug response. No conflicts of interest disclosed. The authors would like to thank the MSKCC Tissue Procurement Service Team (TPS), specifically, Maria Corazon Mariano, Priscilla McNeil, Anas Idelbi, Daniel Navarrete and Katrina Allen, in all of their efforts in the successful pursuit of this project and funding from the following sources: 5 R21 CA158609-02 and the Conquer Cancer Foundation and the Breast Cancer Research Foundation. In addition, the authors would like to thank Eric Cottington PhD, Vice President of the Office of Research and Project Administration, the Office of Technology Development, Research Outreach and Compliance and RTM Information Systems Support, in the support of the submission of this manuscript. Abercrombie, M., Ambrose, E. J. Interference Microscope Studies of Cell Contacts in Tissue Culture. Experimental Cell Research. 15, (58), 332-345 (1958). Coriell, L. L., McAllister, R. M., Wagner, B. M. Criteria for Determining Malignancy in Tissue-Culture Cell Lines in the Albino Rat. New York Academy of Science. 5, 351-355 (1957). Paul, J. The Cancer Cell in Vitro: A Review. Cancer Research. 22, 431-440 (1962). Dean, J. L., et al. Therapeutic response to CDK4/6 inhibition in breast cancer defined by ex vivo analysis of human tumors. Cell Cycle. 11, (14), 2756-2761 (2012). Bray, K., et al. Bcl-2 Modulation to Activate Apoptosis in Prostate Cancer. Molecular Cancer Research. 7, (9), 1487-1496 (2009). Quail, D. F., Joyce, J. A. Microenvironmental regulation of tumor progression and metastasis. Nature Medicine. 19, (11), 1423-1437 (2013). Nakasone, E. S., et al. Imaging Tumor-Stroma Interactions during Chemotherapy Reveals Contributions of the Microenvironment to Resistance. Cancer Cell. 21, 488-503 (1016). Shi, Y., Hogue, J., Dixit, D., Koh, J., Olson, J. A. Functional and genetic studies of isolated cells from parathyroid tumors reveal the complex pathogenesis of parathyroid neoplasia. PNAS. 111, (8), 3092-3097 (2014). Vidal, S. J., et al. Isolation of cancer stem cells from human prostate cancer samples. J. Vis. Exp. (85), e51332 (2014). Wanping, X., Neckers, L. Targeting the Molecular Chaperone Heat Shock Protein 90 Provides a Multifaceted Effect on Diverse Cell Signaling of Cancer Cells. Clinical Cancer Research. 13, 1625-1629 (2007). Moulick, K., et al. Affinity-based proteomics reveal cancer-specific networks coordinated by Hsp90. Nature Chemical Biology. 7, (11), 818-826 (1038). Alpaugh, M. L., Tomlinson, J. S., Ye, Y., Barsky, S. H. Relationship of sialyl-Lewis(x/a) underexpression and E-cadherin overexpression in the lymphovascular embolus of inflammatory breast cancer. American Journal of Pathology. 161, (2), 619-628 (2002). Chu, K., Boley, K. M., Moraes, R., Barsky, S. H., Robertson, F. M. The paradox of E-cadherin: role in response to hypoxia in the tumor microenvironment and regulation of energy metabolism. Oncotarget. 4, (3), 446-462 (2013). Vaira, V., et al. Preclinical model of organotypic culture for pharmacodynamic profiling of human tumors. PNAS. 107, (18), 8352-8356 (2010). Centenera, M. M., Raj, G. V., Knudsen, K. E., Tilley, W. D., Butler, L. M. Ex vivo culture of human prostate tissue and drug development. Nature Reviews Urology. 10, 483-487 (2013). Jhaveri, K., et al. Heat shock protein 90 inhibitors in the treatment of cancer: current status and future directions. Expert Opinion on Investigational Drugs. 5, 611-628 (2014). Gerecitano, J. F., et al. Using 124-PU-H71PET imaging to predict intratumoral concentration in patients on a phase I trial of PU-H71. Journal of Clinical Oncology. 31, Suppl . 11076-11 (2013). Yildiz-Aktas, I., Dabbs, D. J., Bhargava, R. The effect of cold ischemic time on the immunohistochemical evaluation of estrogen receptor, progesterone receptor, and HER2 expression in invasive breast carcinoma. Modern Pathology. 25, 1098-1105 (2012).